Guess who’s back with another HYIP review? Today I’m reviewing a project, which looks very neat at first glance. Yes, I’m a visual person and the first impression is very important for me. Of course, it doesn’t mean I will not take a closer look at other things, but it looks nice to my eye. Probably, it’s all because of the shiny and colorful gemstones. The project is called BIKSBIT and I was very surprised about its age, which is more than a year! However, this HYIP has joined Sticky Listing on 3rd of April 2017 and I will assume it as the actual start date. Just a few moments and you will find out why! I have reinvested into project $360 and will update you about the performance of this project. Let’s move on and see what’s behind the shiny curtain of gemstones. Even though BIKSBIT might seem like a long-time player on the field, there are a few fun facts about it, which might remain invisible for many eyes. This project has been in a sleep mode for a long time and then the whole website was changed – design, story etc. In fact, the website had no sign of gemstone images a while ago and I must admit it looked like a website from good old days. Unfortunately, I have no record of exact dates when the website changed its layout, but there is a great free website called Web.Archive.org where you can see the snapshot of old design archived on 20th of October 2016, but in the next snapshot captured on 15th of February 2017 we can see already the new design. I’m not trying to be Sherlock Holmes here, but we must keep in mind that this project is old news but in a brand-new packaging. Let’s just assume that the actual beginning of this project is 3rd of April this year when the admins joined DavidNews.com. What’s the legend behind the BIKSBIT? Should I start with the old one or the new one? In the good old times, they wrote that it’s a program for people willing to achieve their financial freedom. Moreover, they called themselves a long term HYIP, which is backed up by Forex market trading and other investments. The winds of changes blows and BIKSBIT transformed into a HYIP that extracts, processes and sells its production in the form of precious stones to the representatives of the jewelry industry. I’m not being picky, but I just want to show you facts, which can be found online without any advanced Googling skills. In short, they are now totally into gemstones and this is how the program makes its living. 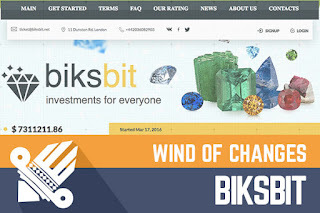 I have already mentioned here a couple of interesting facts about BIKSBIT and it’s time to move on and analyze the investment plans, to understand what can they offer us. They don’t have the highest number of plans, though 8 is enough to cause a confusion for beginners. Honestly, only the first plan – BIKSBIT PRO with its 2.16% daily interest rate for 25 days look financially beneficial to me. Of course, you can examine all other plans and see if you have a different opinion. Minimum deposit for this plan is $10, which makes it more available for beginners. The next stage is a plan called IMPERIAL with a minimum deposit of $500. As you can see the starting point for this plan is already much higher, and it grows even higher for all other plans. Just to give you an example of a potential benefit from my favorite investment plan - a $100 deposit will generate $54 and at the end, the investor will receive the amount of $154. As you might notice, the initial deposit is returned at the end of the deposit term. I mean, this is just a calculation, to give you a better understanding. Of course, many things can happen during 25 days! BIKSBIT accepts the most well-known payment methods in the HYIP industry like PerfectMoney, Bitcoin, Payeer. Moreover, they accept a method I haven’t seen around for a long time – Payza. Unfortunately, I don’t have much to say about it. There are folks saying that it’s hard to verify this payment method for a HYIP, which is the reason for the rear use of it. Therefore, the admin must have advanced skills to do it. As I wrote here, this is something I can’t agree or disagree with. As usually, I’m here to find useful information and write a review, which helps you saving time. Hopefully, each one of you could find something handy or interesting. To sum up everything, you can see here some rapid changes in the program. You can easily Google the web archive and see that the current program and the one which was there a few months ago is like a day and night. What’s the reason for it? Most likely, the main goal was to keep it quiet and get older in days, to position itself like a long-term project. However, the new website is rock solid with a well-structured content and up to date sales approaches. The final call is always up to you. However, remember that any investment in HYIP is a high-risk investment and you can never predict the outcome of the program. Therefore, always evaluate investment risk and invest money that you can afford to lose! Investment plans: 2.16% daily got 25 calendar days, initial deposit returned at the end of the investment term. Ignore other investment plans. Forex Trendy is an advanced software capable of recognizing the most reliable continuation chart patterns. It scans through all the charts, on all time frames and analyzes every prospective breakout. At Free Bitcoin you can recieve FREE bitcoins. Up to 22 satoshis every 5 minutes. Did you ever try to automate your free satoshi claims by using a BTC FAUCET ROTATOR?